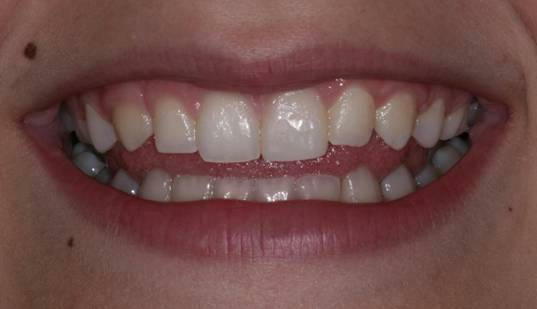 Many patients, especially children, have accidents that may break the front teeth. The patient whose teeth are shown below had a bicycle accident that broke off half of a front tooth. The nerve of the tooth was exposed. Many times when this happens a procedure called a root canal is done to remove the nerve from the inside of the tooth if it is irreparably damaged. In this case fortunately the nerve was able to recover and a root canal was not necessary. A bonded composite restoration was done in one visit adding back tooth that was missing while removing little or no additional tooth. Below are the before and after treatment pictures.